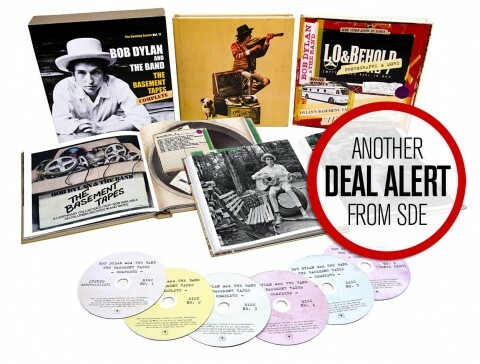 Amazing price right now on Amazon Italy for the 2014 Bob Dylan Bootleg Series box set – the six-CD Basement Tapes Complete. At the time of writing (11am GMT 14/2/17) this box set (which boasts stunning packaging with two superb hardcover books set inside a soft-feel outer slipcase) is just £50 (€59) on the Italian site. The Cutting Edge 1965-66 six-CD box is a similar price! If you like the normal ‘ Basement Tapes’ set, you’ll love this. Do you know if any other Bootleg Series had the same deluxe packaging? Vol. 10 is still available as a 4-CD-SDE for about EUR 70 (Another Self-Portrait), for Vol. 8 there is a 3-CD SDE incl. 2 books as well (Tell-Tale Signs) but that is deleted and so you have to pay about EUR 250 on the usual sites . And not to forget the 18-CD plus 9-45rpm vinyl single and several other stuff SuperUltraDeluxe-version of Vol. 12 (The Cutting Edge), limited to 5000 numbered boxes worldwide, which currently is a regular guest on Discogs’ monthly charts of the most-expensive item of the month (last month one was sold for about USD 1100). As someone who likes to try before buying, I have the 18 disc set in flac. It’s good, but too many versions of the same song is a brave and time consuming listen. I recommend the 6 disc edition as it is more concise, has most of the best versions of the tracks and is a superb set with books etc. Theres a lot of ggod deals on the Italian site for box sets at the moment – Dylan’s Live 66 box for E82, Star Wars 10CD + DVD for E31 stand out. Yes the wait was worth it ,got both sets. 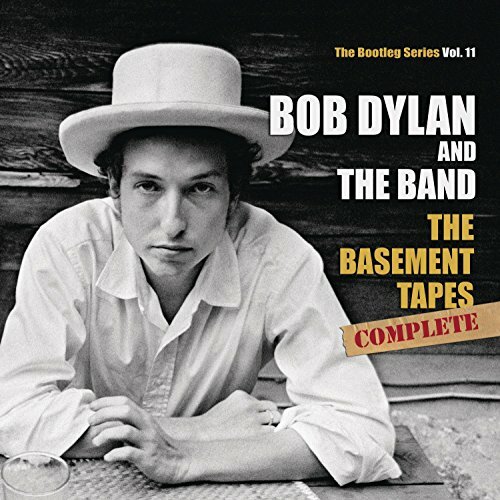 These Basement Tapes are listed as Complete but this one is getting rave reviews also https://www.amazon.com/Basement-Tapes-Bob-Dylan-Band/dp/B001NERPHS/ref=sr_1_1_twi_aud_2?s=music&ie=UTF8&qid=1487102419&sr=1-1&keywords=Bob+dylan+The+Basement+Tapes+mfsl I have not compared these track by track but apparently there are some on the two-disc set that are not included in the Complete offering. Spotify has samplers of both releases. I don’t know if any readers are familiar with the two disc set. Apparently fans need both to be truly Complete. Tom.That is the original Basement Tapes album released in 1975 to discourage bootleggers. The tracks on that album are enhanced with overdubs to make them more appealing. It’s why the BoOtley 11 set is called the Basement Tapes Raw. The one you link to also includes sessions by The Band after Dylan left town. The Bootleg Series is a Dylan series so doesn’t feature any tracks from those sessions. This is a great set and outside of the second bootleg series- the Manchester concert, is my favorite of the series. I picked up the cd set and the vinyl set. Now waiting and waiting for the day the Blood On The Tracks sessions are released. Glad to hear that Mad Earwig, as I have just bought them both. I too hope that hings will quieten down for a while. now ordered as I have been waiting for an acceptable price on this for a while and amazon UK are listing this between £80-£300. Was lucky to have a flac version so know what I’m getting and it is so much better than the normal double cd version with Dylan having a good time. This and the ‘cutting edge’ set are excellent. Bit the bullet and got this and the 6 CD Cutting Edge for the same price. Finding your site really has been good news from a music point of view but disastrous financially. By the way: i just saw that “The Cutting Edge”-6 CD-box currently sells for the same price as well on Amazon.it. Having already got the triple vinyl set cos I have the original Basement Tapes album on vinyl, I then wanted to hear all the extra material so bought this six CD set from Amazon UK just over a year ago for £60 which I felt was a pretty good deal. A truly fascinating collection. All good things come to those who wait…well, in this case i haven’t had enough patience and ordered it in November last year thinking this will only go up pricewise for 88 EUR from Amazon.de. Thanks to CJ for the book suggestion anyways. Similar price for 6 CD Cutting Edge too. From a musical content PoV this is the best of the deluxe Bootleg sets. Also buy a copy of Invisible Republic by Greil Marcus to accompany your listening., His writing style is an aquired taste, but his background research to these recordings and the origins of the older folk songs is excellent.